Lush Fab Glam Inspired Lifestyle For The Modern Woman: Discover Extraordinary Gifts For Mom. Discover Extraordinary Gifts For Mom. 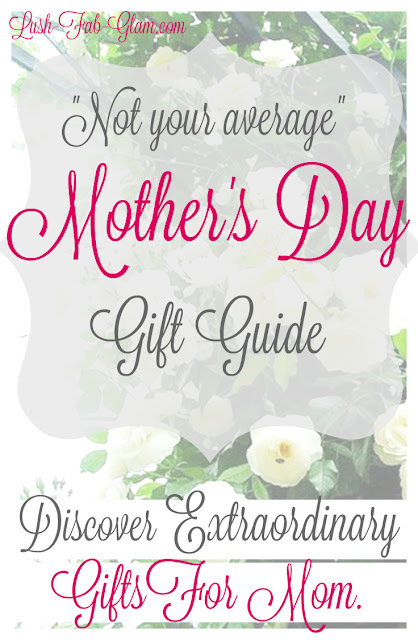 Mother's Day is just around the corner and this year we are taking our gift guide up a notch with gift ideas that are certainly 'not average' in fact they are extraordinary, which is exactly what mom deserves! Click HERE to see the complete Gift Guide and to discover the perfect Mother's Day Gifts for your extraordinary mom. Click HERE to see all the extraordinary Mother's Day gifts and gift ideas that we have curated for mom that are unique heartfelt and are sure to wow her this Mother's Day. Help your friends, family and co-workers find extraordinary gifts for their mom by sharing this gift guide with others using the buttons below.